Football season is upon us, and if you’re like me, I’m more about crowding around the snacks and worrying less about these game shenanigans. Football fan or not, I’m sure we can all agree on one thing—crab dip! Football party finger food doesn’t have to be greasy or poured out of a bag. It can be a little fancy with the help of a few tasty ingredients. Behold, I give you Bacon Bleu-Crab Dip! This crab dip boasts all the good stuff: bleu cheese, cream cheese, Chesapeake Bay seasoning, white wine and bacon! Yes, fried, crunchy slivers of piggy awesomeness mixed among the velvety crab dip. If the pals attending your football shindig don’t jive with bacon, you can always serve it on the side for your guests to scatter at their discretion. And if you’re into prying crabs, by all means, you do you. While I’m all for crab-picking, this recipe calls for canned lump crab meat that’s just as succulent as the real stuff. Preheat oven to 350. Mix bleu cheese, cream cheese and minced garlic in a bowl. Add lemon juice, white wine and crab meat to the bowl. Mix until combined. In a separate bowl, toss the bacon with the Chesapeake Bay Seasoning. In a frying pan on medium heat, fry bacon until crispy for about 6 minutes, flipping throughout. Remove bacon from the pan and blot with paper towels to remove excess oil. Add bacon to crab mixture. Transfer crab dip to an oven-safe baking dish. Sprinkle Chesapeake Bay Seasoning over top. Bake for 25 minutes until slightly toasted on top. Serve immediately with crackers or toasted baguette slices. Of course fancy football food must be paired with a fancier beverage other than the ol’ beer. Didn’t you know Virginia wine is the new libation for football games? 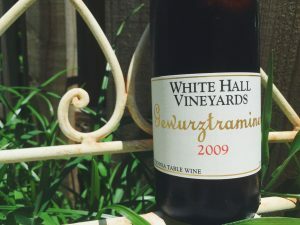 We suggest pairing White Hall Vineyards’ 2009 Gewurztraminer with this heavenly dip as it brings forth the dip’s lemon and spicy notes while evening out the richness of the cream cheese and the pungency of the bleu.